When I was working on the tapestry project and looking for my one and only tapestry bobbin, which surprisingly, was where I expected it to be, I found a warp. This was not just any warp but a painted warp from a Guild workshop, possibly a Summer School and I’m fairly sure it was when the Guild was at the Meat Market as I can remember working in an area used for screen printing which had large tables at a very comfortable working height. In the 1980s the Government set up the old city meat market as a craft centre. It was a great venue and I felt a special bond when I discovered that my great grandparents had lived a couple of doors away. My great grandfather made sausages and where better to do it than close to the back door of the meat market. The Guild was there from 1985 until 1999 when, with very little warning, funding stopped and the place was shut down. The Guild has had 2 moves since and despite all this, the warp appeared to be fine and the cone with the rest of the yarn was with it. 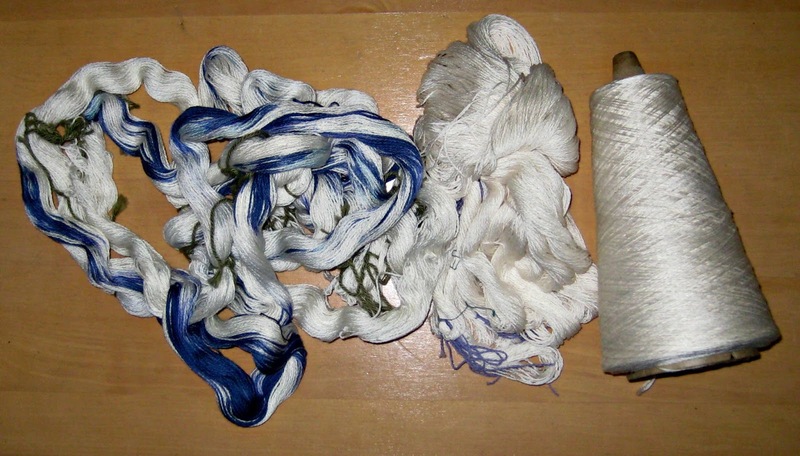 It was a white mercerised cotton warp with what I thought were blue splodges on it and I’d seen a scarf on Pinterest recently with a similar warp, woven in twill with the twill lines appearing and disappearing across the dyed parts of the warp. 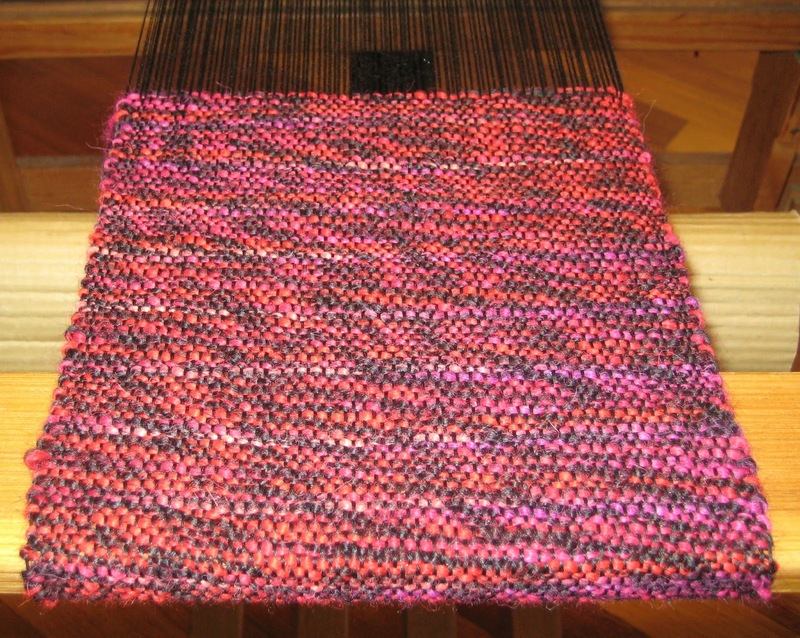 My warp was very narrow so I added a bit extra on each side. But what twill pattern to use? About a month into my weaving certificate, when 4 shaft drafts were still largely a mystery, I had one of the Guild’s 8 shaft looms at home over the Easter break. What do you do when you’ve got an 8 shaft loom in the house and a few days free, but weave an 8 shaft project, even if it’s way outside your competence level. I had a look in Carol Strickler’s book and thought that 323-2 on p88 would give me lots of pattern for not too much complexity. I was too green to realise that there was too much complexity in the illustration for what was involved. I did what the book said - and got something completely different. 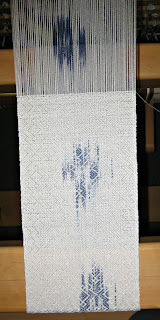 It was a reasonable piece of weaving given my total lack of experience, just not what I had expected. 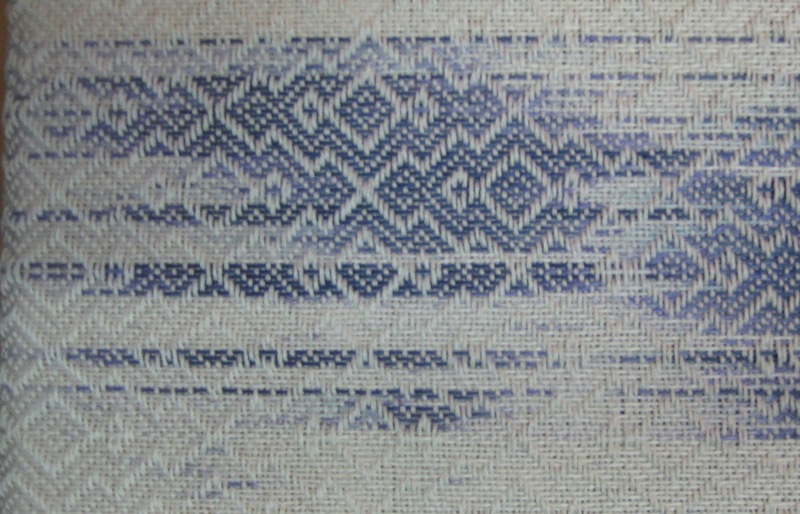 I had a look in Strickler for the cotton warp and decided that I still liked the 323-2 swatch and that it couldn’t be too hard to get it right with a bit of help from weaving software. 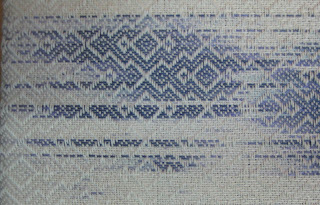 Something made me look at the drafts in Edward Worst‘s Weaving with Foot-Power Looms – just love calling them the Worst twills. There was a similar draft there as well – the first thing I tried was the Worst draft, tie up and treadling, close, but not quite right, then I changed to the Strickler treadling and it was the one. When I first put the warp on the loom I thought the blue areas were just random splodges but as it went over the back beam I realised that they were actually stylised flowers. there’s a lot to be said for letting things mature in the cupboard. 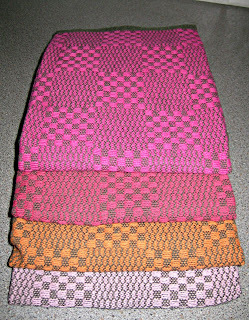 Next after the scarf was a run of tea towels for the next market, the last for the year and for Christmas presents. 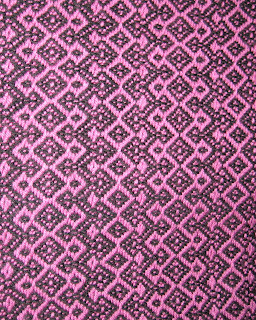 One of the yarns I used was a fantastic hot magenta of unknown provenance but possibly from a guild sale. Something, probably Di’s problems, made me test it before I washed it. I was so glad I did because the dye just ran out of it. I gave it a couple of hot rinses to get rid of the worst of it and then machine washed them all with a couple of colour catcher sheets. Fortunately there were no disasters although I won’t be washing it with anything white for a while. There’s still enough warp for another 8 or 9 towels so I’ll be able to play with a few more colours. I have also been playing with solar dyeing and thick and thin spinning, so I put a black warp on to the 4 shaft loom to use up these yarns and some others I had bought. 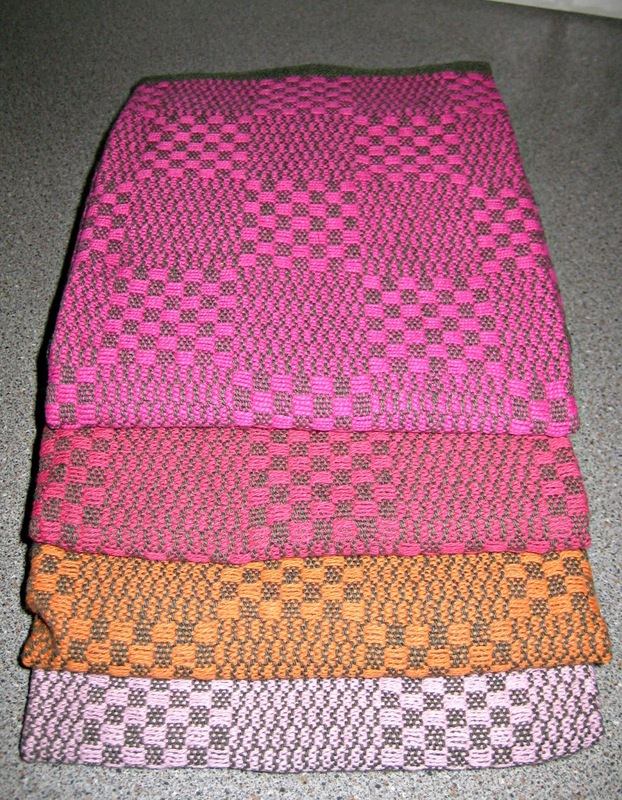 I’ve produced some nice warm scarves, just the thing for a hot Australian Summer. 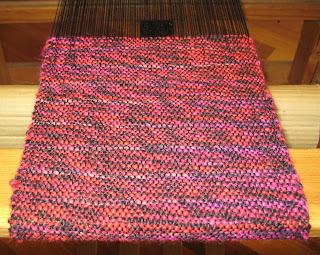 One of the yarns was a nice heavy alpaca yarn, various shades of red plyed with black. 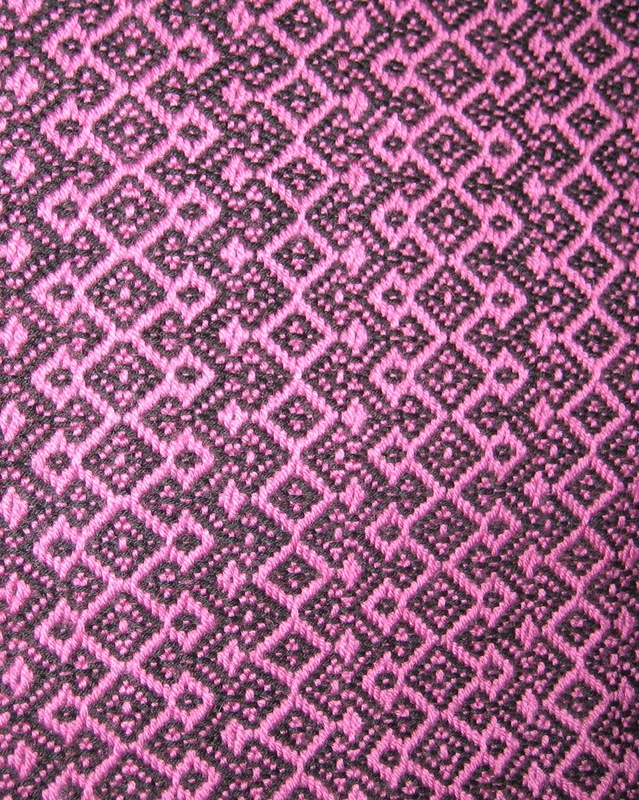 As I wove it the scarf looked longer on one side than the other although both sides measured the same. but couldn’t bring myself to buy the acid green they had as well. I received my schedule for the 2016 Sheep Show Woolcraft competition today, I suppose it’s not too early to start planning. I thought the jacket on the back cover looked familiar and then I realised it was my entry from last year. I guess that’s fame in the Woolcraft world.